This spring I decided to have a short city trip to London. After searching several days for the right hotel, I decided to book 4 nights at the Cardiff Hotel. It is conveniently located only 5 minutes from Paddington station. Paddington is one of the main train stations in London (City of Westminster). Both Heathrow Express and Heathrow Connect depart and arrive from this station. So if you have an early flight out of Heathrow, this is the right area to stay in London. Several Underground lines stop at Paddington station, which makes it a great starting point to explore London and the surroundings. I booked a Single room on a online booking site. When I arrived I got the info that I got upgraded to a Double room on the 1st floor. The room had a “typical size” for B&B’s and hotels in old buildings. The bathroom was quite small though. The room featured a double bed, a desk, a closet and a flatscreen tv attached to the wall. The en-suite bath room had a small sink and shower area. The room is okay for a short city trip, but please in mind that it is an old building and has little heat/noise isolation. The hotel offers free WiFi throughout the hotel. I was able to check my emails and Facebook on my tablet both in my room and at the breakfast room down stairs. Breakfast was included in my rate and I used it every day. The breakfast buffet offered English breakfast standards like bacon, baked beans, sausages and tomatoes as well as toast, fruits, cereals and juices. Huge thumbs up! I like the hotel. 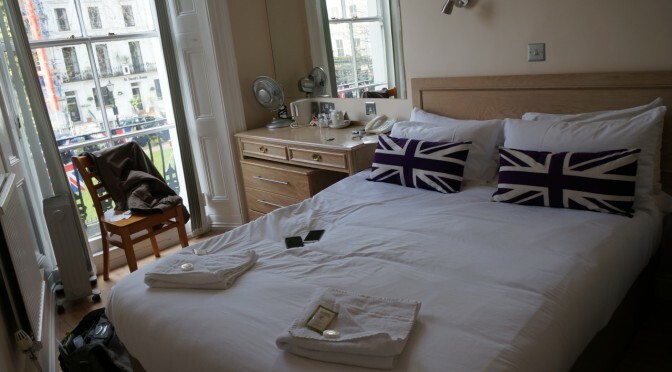 It’s perfectly situated near Paddington station, has free WiFi, free breakfast and is nice for a short city trip.